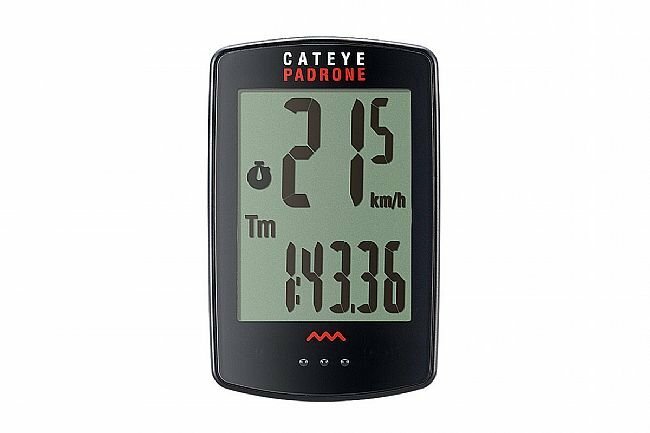 The CatEye Padrone Cycling Computer is a simple, functional wireless cyclocomputer with one major feature that sets it apart from many others—you can actually read it! Nearly twice the size of CatEye's popular Strada Wireless model, the Padrone offers all the same features in a tall, wide, easy-to-read package. Set-up is easy and straightforward, and the ClickTec interface allows switching between modes by simply pressing the lower half of the computer's face. The Padrone runs on two CR2032 batteries, one in the head unit and one in the included speed sensor. The FlexTight bracket is included which fits on handlebars or stems from 22-32mm. like the stronger Nite Rider models will interfer with the operation of this unit when the lights are in the flashing mode . The mileage and speed will go to zero or read incorrectly . This will not happen with GPS computers . Be aware ! Roadie here I bought the Padrone because it has the same features as the Strada RD300W, minus the pace arrow, on an easier to read screen, for less money. Setup went smoothly and the mounting hardware is all top notch quality. The unit size is large enough that I believe it might be a little clunky mounted on the handlebar, seems more in its element on the stem or with out front accessory. I have it mounted on the stem and it looks great. The sensor can be mounted on the right side of the fork facing backward (not recommended, as it would be sucked into the spokes should it be knocked inward) or the left half of the folk facing forward. Magnet has stayed in place so far with bladed spokes. Sensor size is average. - Unit clicks into its mount very securely. - Padrone is single touch, glove friendly operation. The button on the back of the unit is activated by pressing the lower edge of the unit, rocking it on its mount and depressing the button you cannot see. This is great, except that I accidentally reset my trip data three times on my first ride. You may not realize it, but when you're off your bike making a pit stop, the stem is often what you grab to walk/hold your bike. I reset it twice off the bike and once while riding. I would love if they added a hold switch to the side so that two things need to happen for data to be lost. - Yes the screen is considerably larger than your average basic computer, but, in operation, there's a considerable amount of screen space that is wasted. Padrone form factor with ANT capability would be sweet. - The odometer will reset when you replace the battery, but there is a way to manually enter a desired odometer reading after the new battery is installed. - I have not ridden enough to judge its susceptibility to interference. my wife and I each have one on our road bikes,with both computers set up the same. On a 50 mile ride together, her's will say about 2 miles more than mine,avg. speed will vary by about .5 miles,and riding side by side hers will say she is going about.5 miles an hour faster.they should read data closer together.also we had to try different headlights because they interfered with the speedo even working. Computer easy to install and very easy to read ! I use this computer on my Roubaix road bike. 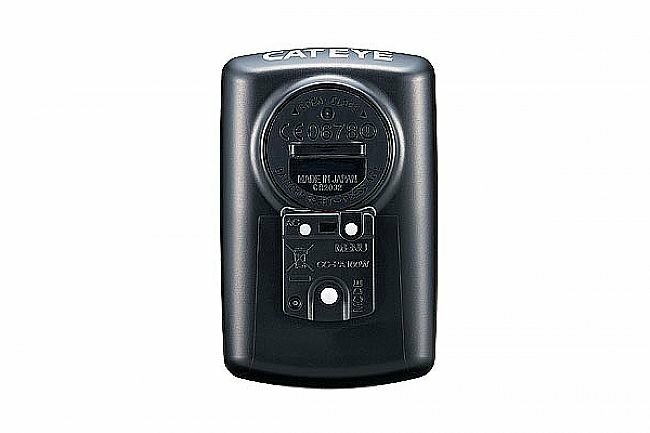 I previously had a base model Cateye and it was difficult to read as it had a smaller screen and did not show average speed which is important to me. 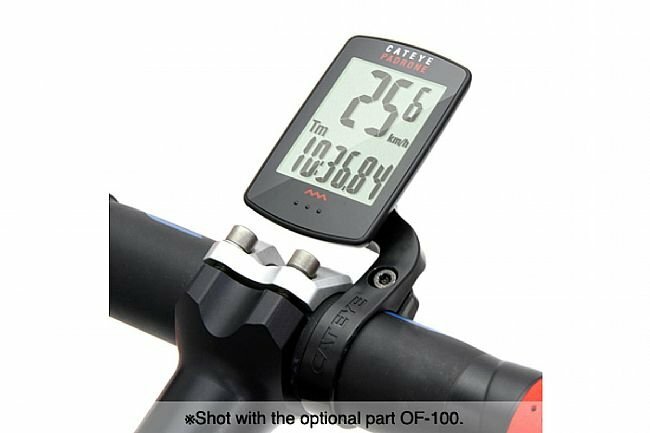 Measuring distance and speed while cycling. Really like the size of the read out info, easy to install, not as easy or clear to use as it could be. Could use some improvement in labeling for use by adding some info to the unit. Little tricky to get installed and configured, but the directions are pretty good. When you install the mount, be aware that the little plastic wheel has to be tightened down so that you can have a tight cable. Not 100% clear in directions. Once I got that, things came together. Very large display for us old folks! I like it. Road use on stem and out front mount. PROS Color choices, price if on sale, works as well as other Cateye wireless computers, and instructions are getting a little easier. CONS Biggest Cateye screen but it just shows the same data as all other Cateye computers (except the Smart or GPS ones). Cateye should have gone with 3 rows of data on a screen this size. Cateye should have made a GPS Padrone with this big screen instead of the Smart model with tiny screen. Cateye just doesn't get the obvious. While I have two other cat eye products I really like, I bought this one for a hybrid bike I own. However, it seems that the extra mass of the huge (easy to read) display just overwhelms the base and it falls out. I have resorted to electrical tape to hold it into position, which does seem to work, for awhile. In the end, because of concern for losing it bouncing down trails, I moved it to another road bike that sees less bumps that might dislodge it. Simple and Easy - maybe too much so. The Padrone Cycling Computer works flawlessly for me. I love the big display. If I have a single complaint, it would be it's almost too easy to reset the ride measurements. Pressing and holding MODE (the only button on the face of the unit) when on the measurement screen resets all measurement data to 0 (excluding Odo) - something I have accidentally done several times. Really like this, i went years without recording anything on my rides, I liked the look of nothing on my bar. The white Padrone looks great on my blackredwhite Cervelo. I have had no issues in 2 months of regular use, easy set up, standard functions and great display. Again i knew i did not want this on the bar and when I ordered the Pradone i also went on line and ordered the CatEye Out Front Bracket Mount which turned out to be a perfect for the set up i wanted. Disappointed. Have yet to get it to work. Speed sensor not communicating with computer! I have written the company in Japan for further trouble shooting advice, but I have been messing around with this thing since I have gotten it. It sure has a lot of potential,,,,,but not for me! Thanks for your review! I'm sorry to hear you're having trouble with your computer. We haven't heard of this issue happening. Please get in touch with our customer service department at [email protected] -- we'd love to see if we can help you out, or arrange a return of your potentially defective item. Easy set up. Large numerals to read while your on gravel roads. Eaxtcly what I was looking for. 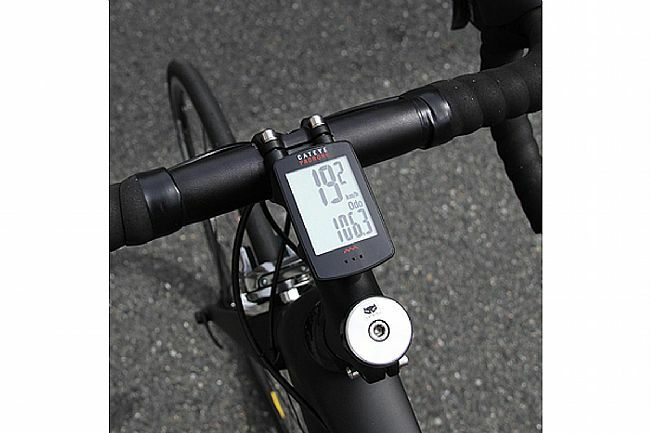 The Cat Eye CC-PA100W is a excellent Cycling Computer so easy to operate and an extra large screen. I use the Cat Eye daily in my ride, love the ease of operation and the size of the screen. This is my 2nd Cat Eye CC-PA100W I have purchased this year just recently bought a Giant Content SL Cat Eye works perfect. Very easy to read and functional computer. This is my go to, on-bike computer. Easy to install and use. Very cryptic user interface. Poor installation instructions . Keeps on loosing sensor data when in sensor only mode. Can't switch easily from Smartphone to sensor only mode. Why do I have to drain the battery on my iPhone just to see speed and cadence??? I needed a larger display for my MTB and this was perfect. I use a smaller wireless version for my road bike. Product is easy to setup and even easier to use.